They consist of a high speed and turbulent “Venturi” zone, where the close contact between water and dust occurs, followed by a zone where drops are separated from the air. The wash water can be running or recirculated with pumps, or even from the flow of the aeriform substance itself. 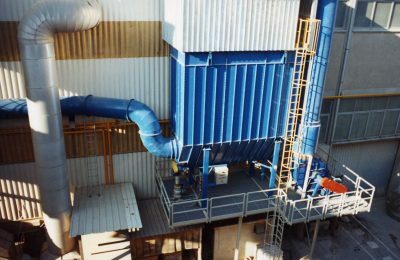 Depending on the concentration of incoming dust and the concentration accepted on exiting, low, medium or high speed systems can be used, with consequent load loss. The management of waste sludge has various solutions and is studied according to specific cases.